The Cult of Obama is disintegrating before our very eyes, and fundamentally transforming America has not proven as easy as Barack Obama had once anticipated. Now, it’s only the True Believers and the uninformed who cling to him still. As a True Believer, Drew Westen was not, I assure you, speaking hyperbolically. If you’ve ever wondered how tyrants come into power with the full sanction of the people whose minds they control — that, reader, what you just read by professor Drew Westen, is precisely how. 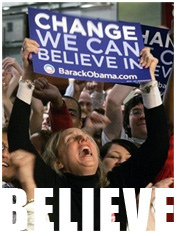 Yes, the Obama cult is disintegrating. The primary reason: Obama’s dyed-in-the-skein neo-marxist politics, which, among other things, led to Obama’s brainless acceptance of a cultic doctrine called Keynesian economics — a colossally flawed doctrine which, mathematically speaking, can never work, no matter how many Nobel Laureates propound its virtues. I speak not to the True Believer (because he no longer has ears to hear me) but to the moderate believer when I say that the sooner you come to terms with this fact — the fact that Keynesian economics with its endless borrowing, printing, and spending can never lead a country or a county out of poverty and into prosperity — the sooner, then, that this country will begin to heal at last. In the same way (and for the same reasons) that the majority of socialists do not know they’re socialists, so, too, the majority of Barack Obama’s followers don’t know the political-economic ideology they’ve accepted. For most, it never mattered. And yet what I wrote in 2009 is, I believe, more relevant now than it was even then; so I’ll say it again: those millions who fainted and swooned over Obama’s easy platitudes but never bothered to question his actual political-economic ideology, even when he spoke of “fundamentally transforming America,” that, reader, is the stuff of nightmares and nationwide cults. The reason the majority of Obama’s disciples don’t know the socialist ideology they’ve accepted is that the majority have no actual understanding of even the most basic political-economic principles, and that is why the propaganda of the leader — e.g. “We’ve actually been operating in a way entirely consistent with free market principles” (Obama, 2009) — works well on the believers. This, of course, is as true of the right as it is of the left. Because of America’s unique origins, there exists in the minds of many, many Americans a bedrock belief in the principles of liberty, individualism, and hard work, which are the diametric opposite of the entitlement mentality that socialism fosters. This conviction is almost never explicitly codified by those who hold it, and for this reason that hold is tenuous and poorly defended. And yet the conviction exists. As a matter of fact, it’s bred deeply into the very fabric of America, so that uprooting it by force, as Barack Obama intended when he spoke of “fundamentally transforming America,” created a massive counterforce from coast-to-coast which has stunned Barack Obama, his whole clownish administration, and ultimately precipitated the disintegration of the Obama cult. Because of America’s origins, the spirit that’s become engrained in the minds of so many Americans would rather the country were torn asunder than let a race-obsessed, intellectually weak, neo-marxist poseur succeed at fundamentally transforming it. It is, finally, important to note also that the principles of individualism, life, liberty, and the pursuit of happiness, which define the American spirit I speak of, are not, contrary to popular belief, anti-charity, coldhearted, or unkind. Just the opposite: America has been by far the most generous and charitable nation in human history, and for one very good reason: we could afford to be. Obama’s plummeting approval, as of August 11, 2011. I completely agree with you. But what is up with the 43% who still approve? Is the cult that big? I wonder what evidence would change their mind? “Neo-marxist”? Just what’s so new about his vitriolic class warfare rhetoric? Yup, when pointing out to these mindless cheerleaders that their messiah was a socialist many of them responded in terms void of any understanding of socialism. Many could not frame Carl Marx accurately in a discussion. Every generation or so theres some fool who tries to make socialism work under the premise that those before him failed just because they did it wrong along with repackaging that mis-labels what it truly is. You cant convince someone they’re being poisoned if they cant see it for poison. Ah, yes. And that poison comes in soooo many deee-lightful flavors. Sieg Heil! Yes We Can! National Socialism, re-branded. p.s. Speaking of national-level socialism, three cheers for the 11th District for correct ruling on Torpedocare!!! Dale, what do you think the SCOTUS will do with it as it conveniently goes in front of them weeks before election ? Thanks for asking, but what I think and 5 bucks will only get you a fancy cup of coffee these days. I cannot fathom the electorate supporting this insanity again, regardless of the court. To be honest, Micky, I think they will toss it out on its unconstitutional ear. I’m not too sure of anything coming out of any branch these days. Thats why I asked. I’d like to think they’d see how unconstitutional its is but I cant bring myself to hold my breath. As big an idiot as this man is it seems hes still able to choreograph certain events to strategic points in time such as the Killing Bin Laden movie coming out right before election. After watching legislation get rammed thru the way this did without nearly enough people questioning it I got as upset with todays politics as I’d ever been. I cried harder than the day he was elected. You know, him I understand. He’s on a Jihad to destroy our prosperity. All his actions confirm this, most definitely the results. It’s Reid Pelosi Biden Kerry Clyburn Schultz Weiner Frank on and on I don’t understand. For the insatiable need of power and control, they destroy the very thing they claim to protect. Then there’s the dipsticks that vote for them. Sorry for the foul language above, Ray. Sometimes you need to name names. What they’ve done is brazenly violated our constitutional rights, based on their high moral judgment, so that they can discriminate at will, literally deprive us of health care. I don’t think the stupid movie is going to help the Torpedo: anyone dumb enough to vote for him won’t be able to afford to watch it on their unemployment checks. One, imagine what would happen to the economy if B.O. admitted it was wrong and would immediately cease and desist, void it, repeal it. Oh, the Torpedo could surely do things to help the economy, that being just one. Two, what if…? The infamous Tea Party quietly chose a major media outlet, public airwaves, like one of the big three, and bought their stock over a period of a year or two until they had controlling interest. Vote in a new board, gain control of the news division, fire every stinking liberal, hire only professional objective journalists. Now, wouldn’t that be fun? you mean the “professional objective journalists” part ? I wouldnt invest in the big three unless (i had a lot of f-ing money) I could only own the entertainment sectors. That 1/2 hour a day of news is losing value everyday.